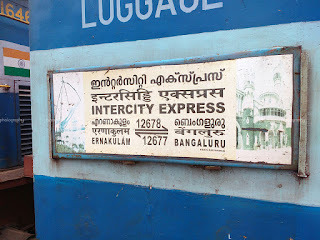 The last minute change in plans, the scramble for tickets, confusion, all ended up with me and my colleagues turning up at the railway station to travel to Kerala, without a return ticket. We had to return from Kerala on a Sunday, and buses appeared to be filling up soon. Trains were sold out as well. We had two options - to take a chance and book train tickets in Tatkal Quota; or book in a bus. My first stop was redBus, which showed some fairly expensive options. The next option was the KSRTCs. First was Kerala - they showed a really expensive option (all thanks to the stupid idea of charging end-to-end fares), which I was not interested in. Next was Karnataka, who had opened reservations for two special services! The last among the specials had lots of seats! The fare was on the higher side (compared to expectations), but we still decided to book. The plan was to drive home with my colleagues, to attend a conference and have a short picnic. Things were all going fine till the evening prior to the planned departure. We had charted our route, planned our breaks and even had a checklist of things we should be carrying. However, my car - which we were planning to drive - was still in the workshop. Although I had given it for a routine check-up and service, some issues cropped up, necessitating replacement of a critical component, which couldn't be procured by the workshop till late evening. The bad news was broken at 1800hrs - less than 12 hours before we were supposed to depart! It is very rarely that I go on a travel without a return ticket. I did that with confidence since I was traveling on a weekday, that too on a Wednesday. March 01, 2017: I was done with my work by around 0930hrs, and then went in for a fairly heavy breakfast. I had some more work at my hometown, and hence returning to Bengaluru before evening was out of question. I decided to take a Sleeper bus this time, and checked the usual options on RedBus. 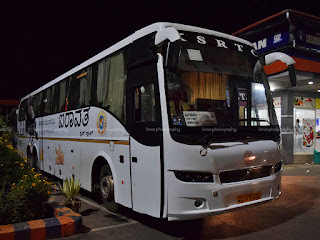 All of a sudden, I thought to try the KSRTC Ambari Sleeper. I wanted to check the bus once before I booked the ticket. I walked down to their parking in Thrissur to check the bus, and found a fairly new bus there. 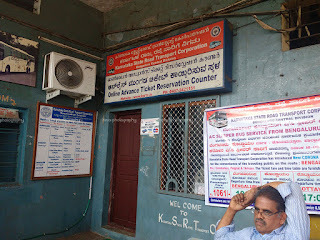 I booked a ticket at KSRTC's own reservation counter at Thrissur bus station, saving some money that I'd have paid as transaction charges otherwise. All of a sudden rises a demand to go to Kerala, to Thrissur. The need popped up suddenly, and the journey was right in the middle of the week. I had plenty of options - all of them had lots of vacant seats and all of them had heavy discounted fares. I had to be in Thrissur very early in the morning, effectively ruling out the buses that leave Bangalore late in the night. 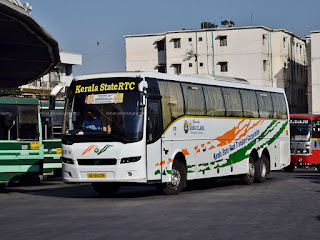 I narrowed down my choices to early evening departures, and without much confusions, I zeroed in on Kerala SRTC's Garuda King Class to Trivandrum, that leaves Bengaluru at 5pm. I decided to book the ticket over the counter, and did the same the day prior to my journey.